It's been an awfully long time since I've posted here, but the inspiration has struck once again! On July 30, I'll be performing one of the solo parts of Mozart's famous Sinfonia Concertante for violin and viola, K. 364 (or, K. 320d if you follow the revisionists). This has long been one of my favorite pieces of music and indeed, I've many times concluded that this is among Mozart's best works of all. David Felberg will handle the solo violin duties, and I'm really thrilled to be performing with David. No only is he a terrific musician and violinists, he and I have been friends since college at the University of Arizona in the late 1980s. And we're both from Albuquerque. So here's the twist! Since December, I've been playing on a Luis and Clark carbon fiber viola. Their #34, to be exact. I purchased this instrument used, and have spent a fair amount of time and effort making it as good as it can be. I replaced the metal tailpiece with one of boxwood. I added my own chin rest - one that was made for me in the '80s by the Old World Violins shop in Albuquerque (it's long gone). The strings are now Warchal Brilliant A, G and C, and Obligato D. I will probably go with all Obligato, with a Warchal or Evah Pirazzi synthetic A at some point. Steel A strings don't tend to sound so great on this thing. Here are some photos, taken prior to the final tailpiece, chinrest and strings. So, now that I've done all these things, how does it sound? In a word: spectacular. I've never played a viola that produces such a huge, penetrating sound with so little effort. It's loud. It is a tad bright sounding, and has a certain edge to the sound, especially up close. But from a distance, it is unmistakably a "viola sound" and just huge. I'm really enjoying that part of it - it is rare to play a viola, of any vintage or price, that can compete with the L & C in this regard. 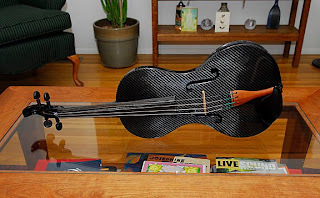 It's also a conversation magnet, since it is so rare to see a stringed instrument that is A) black, B) really shiny, and C) up close it is clearly different than anything else. After just about every concert I've played in the past six months, people have approached me afterwards to ask about it. So on July 30th, 2011, in Keller Hall at UNM, 7:30 PM, it will be a Luis and Clark carbon fiber viola along side a J. B. Vuillaume violin, in the hands of two Albuquerque natives, playing one of Mozart's best compositions. Accompanying us will be the Albuquerque Philharmonic Chamber Orchestra, under the direction of another Albuquerque native, Maestro David Chavez. Be there if you can, and let me know what you think of the new viola. Well, I had a blast - it was the highlight of my musical life thus far on Earth. Thank you to David Felberg, David Chavez, the Albuquerque Philharmonic Orchestra, and of course my wife Jane who has been incredibly supportive during the past months. No doubt living with me hasn't been easy as I have practiced this piece more than anything I've ever practiced for in my life. Whew! Now what?